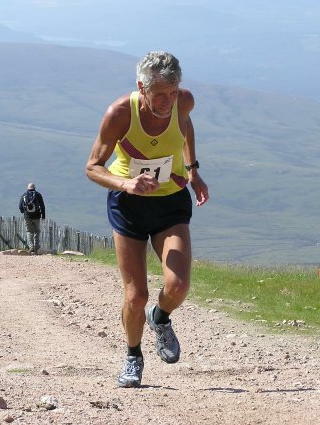 George Mitchell (1945-2014) ran for Inverness Harriers and SVHC. 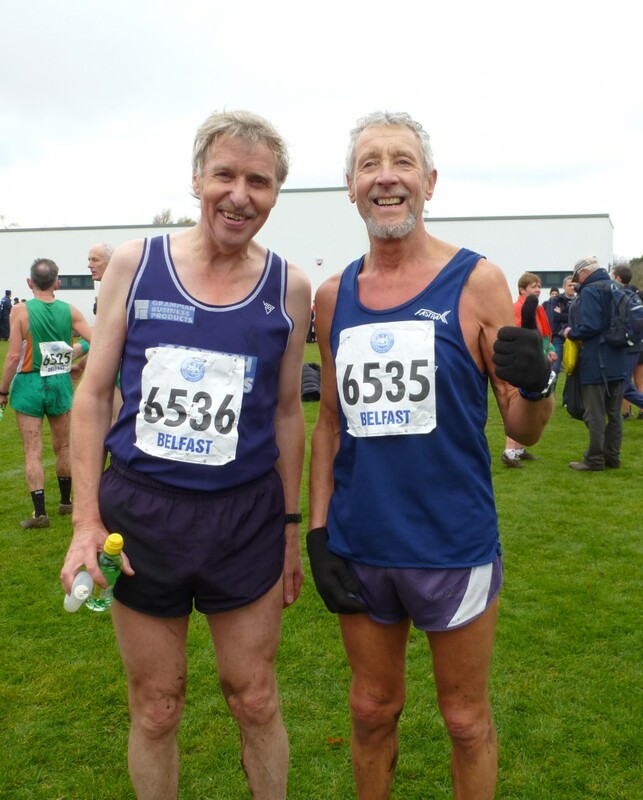 He was an invaluable member of the Scottish team in the annual British and Irish Masters Cross Country International. Between his M55 debut in Cardiff (2003) and Belfast (2012), when he was in the M65 age group, he never missed a race: ten in succession, a tremendous record and a testament to George’s consistency and ability to peak for each year’s most important fixture. George watched the Glasgow Marathon in 1983 and, at 37, was inspired to take part the following year. His training was typically dedicated and meticulous and he made an impressive marathon debut in a good time under the three-hour barrier. After that, he was frequently successful in 10k contests and the North District Cross Country League (three M50 Supervet titles). He first won a Scottish Masters CC Championship medal (M50 bronze) in 1996. His initial gold medal triumph (M55) was at Forres in 2003, when he stayed not far behind Colin Youngson until three hundred metres from the finish, before launching a tremendous sprint, to which his shocked rival (who had foolishly assumed he was well clear) could not respond. It has to be admitted that Youngson was a bad loser and moaned loudly to anyone within earshot. However, once he had eventually calmed down, the guilty Aberdonian made several humble apologies to George, who was magnanimous enough to accept them. Justifiably, George liked to tease Colin about the incident. 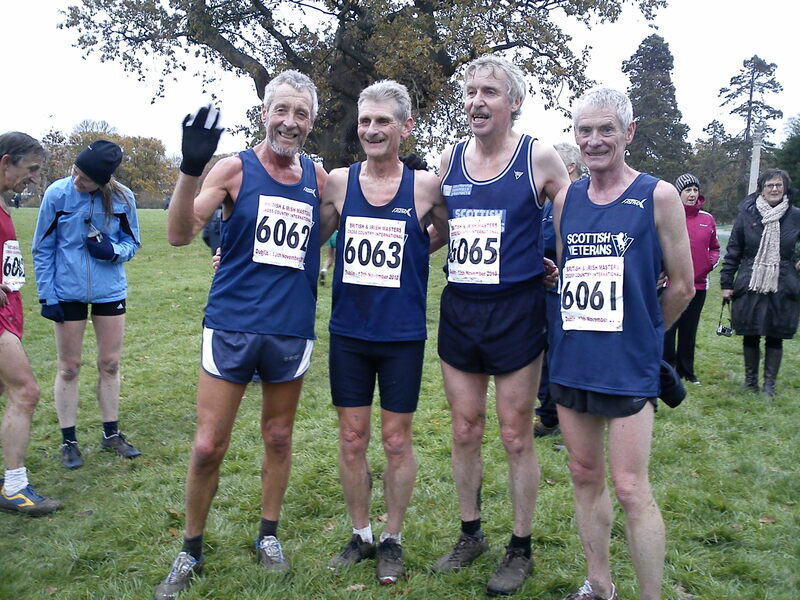 Although Youngson gained revenge in the 2004 championship at Cupar, when George Mitchell was third, this was the last time that Colin managed to finish in front of his rival, team-mate and now friend, who was truly a cross-country specialist. In George’s age groups, the only Scot who had much success against him was Archie Duncan of Pitreavie AAC. Overall, between 1996 and 2013, George Mitchell won four titles [M55 (2003), M60 (2006 and 2009) and M65 (2012)] plus five silver and three bronze medals. George’s record in the International was perhaps even more impressive, considering that he was racing against the best from the four home countries, plus Eire. In ten races, he was first Scot to finish seven times, and won eight team medals (four silver and four bronze). Between 2006 and 2009, he finished fourth three times and fifth once, agonisingly close to securing an individual award in this most prestigious event. Then, having turned 65, he finally won bronze at Glasgow in 2010, defeating England’s redoubtable athlete, Martin Ford. In 2012 at Belfast, George ended up third once again, 25 seconds in front of Colin (7th place), who was proud to have been that close to his leader and, along with Stewart McCrae and Hamish Cameron, to be in the Scottish M65 team that came second to the Auld Enemy but in front of the other three nations. George was a friendly, popular, respected man with a dry wit. One story involves a training companion and close rival who intended to race against George in a long road race. Before the start George gave him some friendly advice about sensible tactics. Then Coach Mitchell wrote on the race number pinned to his own back: “If your name is Danny, and you’re close enough to read this, you’re going too fast”! Another anecdote is that, when George won the Scottish Masters M65 title, he claimed to be ‘the fastest pensioner in Scotland’! He trained hard and cleverly, peaked well, was tactically brilliant and could endure a lot of discomfort in races before producing a very fast finish. In addition, he contributed greatly to Inverness Harriers: committee work, advising and inspiring younger team-mates, and helping to organise training and races, including marking out the course. He held age-group Parkrun records in both Inverness and Aberdeen. Before a North District CC League race at Elgin back in 2010, George was chatting to Colin when a younger runner looked at the two white-haired ageing runners and laughingly exclaimed “Jack and Victor!” He referred to the two pensioner friends from the great Scottish television comedy series “Still Game”. Colin (a year or so younger) used to think that he was the one who ought to be compared to Greg Hemphill’s junior character. However George Mitchell was in so many ways a genuine victor and will be remembered and missed very much by many who were privileged to know him.